Not that good on the computer much better at pitching a rubber worm!!! Welcome Rob… I enjoy kayaking and use my kayak as a means of transportation to move from spot to spot. I fish from my kayak, but I prefer wading. I wish I could stand and fish from my kayak, but it's not stable enough… I guess it's more like I'm not stable enough. 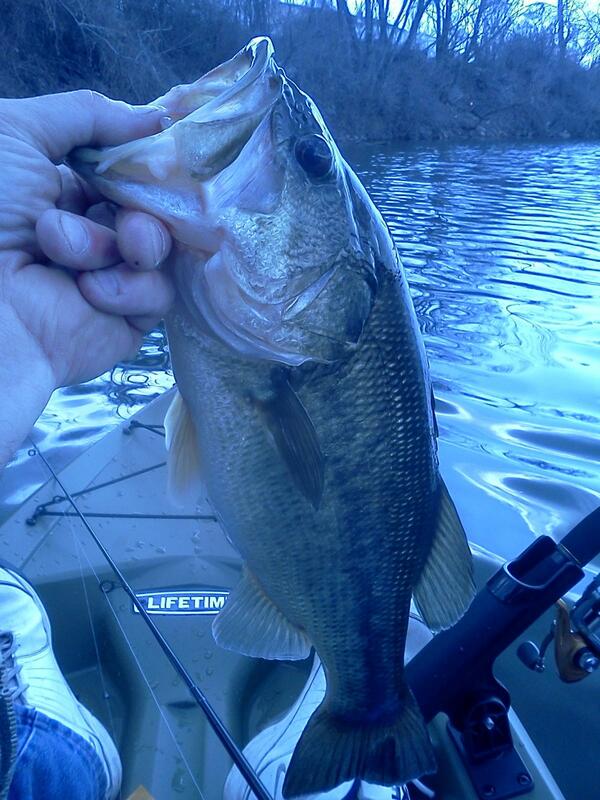 Have you been out yet this year in your yak? I usually wait to water temps get into the mid-60's. A three pound bass is certainly a nice one for our local waters! I'm usually chasing shad until the water temps get into the mid-60's. Those float tubes look extremely relaxing. Never went for shad! Do they fight good? Maybe not 3lbs but 2 for sure! Nice fish! I had one about that size today. Fishing has been brutal with these winds. American shad IMO are pound for pound the best fighting fish available in our local waters. Unfortunately, they are only available during a portion of the spring season. Carp would be a close second and my true favorite simply because of their size, craftiness and power. Good to hear you're out and about Jonathan. Are you fishing your local honey hole? Yeah. I figured the shallower bodies of water would produce better. Have you been out at all? I'm itching to try for stripers and shad on lures at the dam. I've been out quite a bit over the past couple of weeks (NO KAYAK YET). Been picking a few here and there.